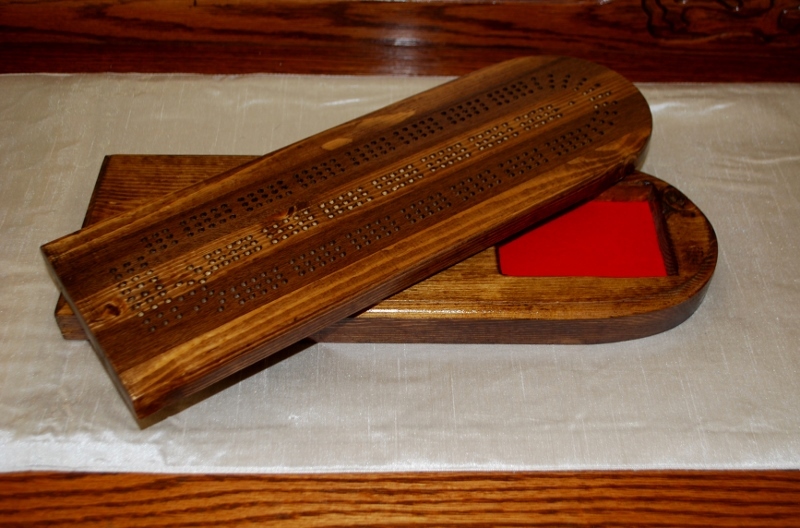 At the beginning of my last woodworking program, middle child asked if I could make her a cribbage board, for the purpose of teaching her boyfriend how to play; all three of our children grew up playing card & board games, and as young adults, they each continue to play. 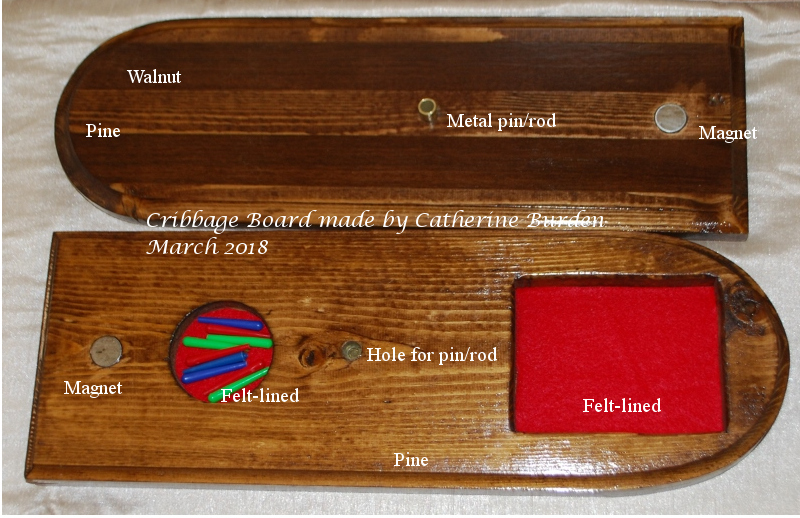 Thus a cribbage board was to be my project for the term. For the woodworking program at the senior’s centre, I was once again lucky to have Bert as my instructor. Bert is amazingly patient when it comes to assisting the seniors (and almost seniors-55+) in his class, all at different levels, working on all our own projects. He has a wicked sense of humour – especially when it comes to measuring and using math. I basically had to relearn fractions all over again, and practice, practice, and practice more. Still fractions are not my friend. 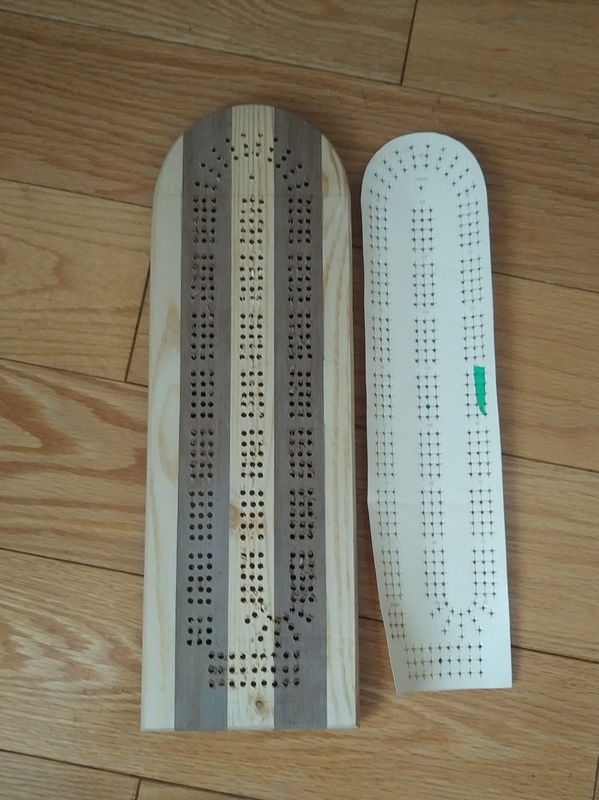 Finding a free pattern of all the holes on a standard cribbage board was surprisingly not all that difficult with the internet at my fingertips. With numerous pages of directions, plus a printed template, I was all ready to make a board from scratch. To make the top piece, my husband had a spare piece of walnut that I was able to use, along with some leftover pine from another project, I had enough wood to make the board. It had also been decided that the main game board would sit upon another board, which would house the cards, and the pegs. The first thing I had to do was plane the wood so it was all the same thickness, then using the table saw I cut the walnut, and pine into four vertical pieces which were glued together to form the top of the game board, whereas the bottom was made only of pine. 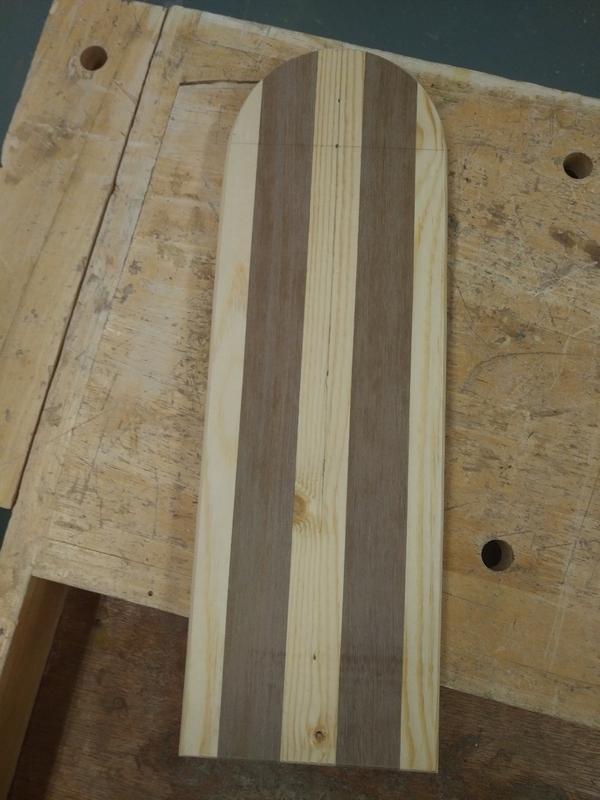 Using the band saw I rounded off the one end of the board, sanded, then used the router to make a more presentable edge. Next it was on to the holes, all two-hundred plus of them! With the template taped to the wood, I used an awl to make an impression of where each hole would be. The small hole also gave the drill bit something to grab once the drilling began. After each hole was drilled, I once again planed the wood. Cribbage board after holes have been drilled. The bottom piece took a bit of creative thinking to figure out how to make the square space for the cards to sit in. What I actually ended up doing was cutting the piece of wood in half, then on one piece I drilled a small hole in order for me to use the scroll saw. It was then quite easy to use the scroll saw for the square. The edges of the square were also routered. Next the two pieces of wood were glued, clamped, and left to dry. 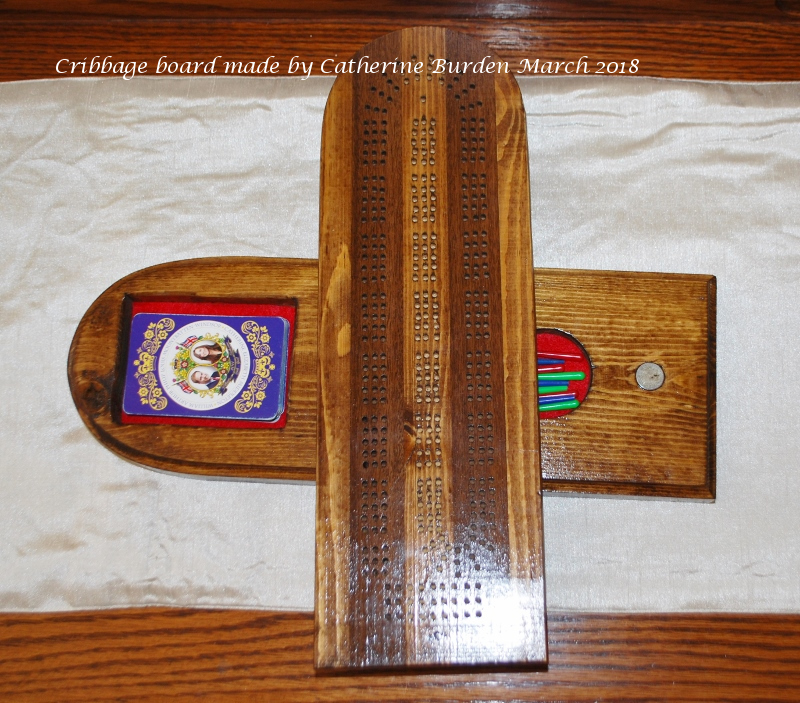 Once dry, a Forstner bit was needed to drill the hole for the pegs, and a smaller hole for one magnet (a corresponding hole was drilled for the other magnet on the top piece of the cribbage board, the magnet would snap the cribbage board together). Two holes were then drilled in the top and bottom for a small brass pipe, allowing the top of the cribbage board to swivel. After being stained, Cribbage board with pegs and a deck of cards. As you can see, I lined both the card holder and peg holder with felt. The underside of the top of the cribbage board, and the bottom piece of the board after being stained. 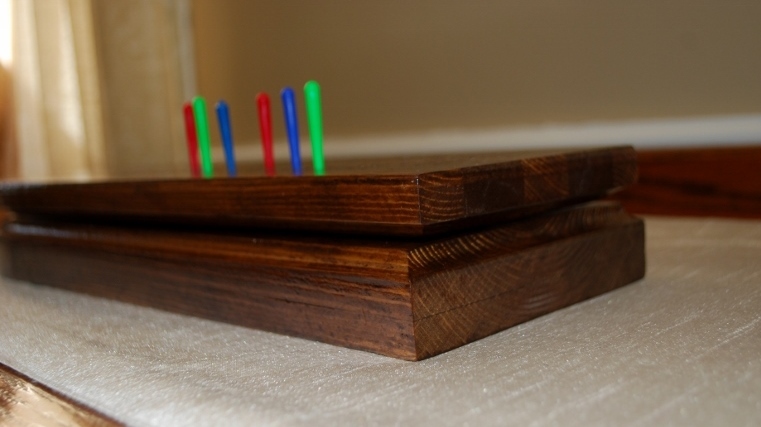 Side view of Cribbage Board with pegs. View of cribbage board swivel. 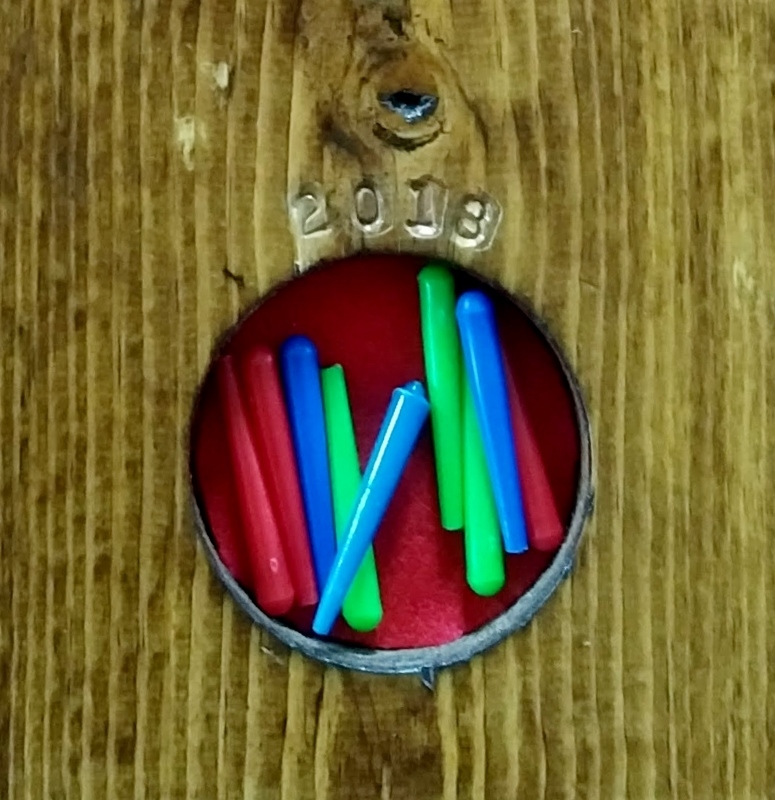 The year was stamped into the wood by my husband. 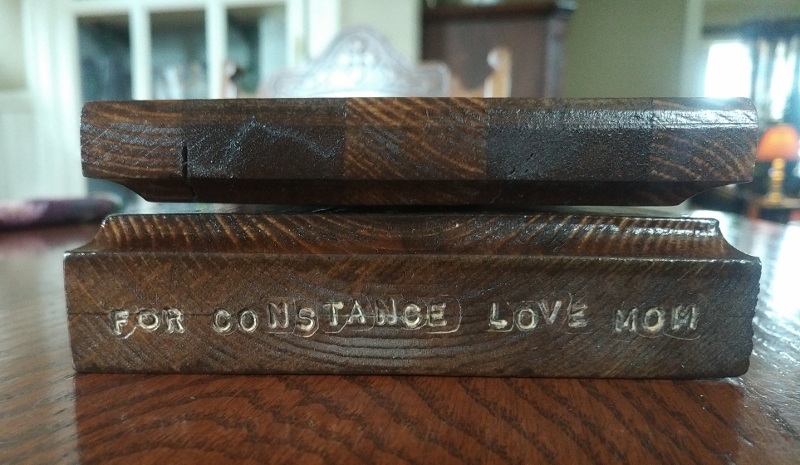 My husband has made sure middle child will not forget who made the Cribbage Board for her: “For Constance Love Mom” with his stamping tools. 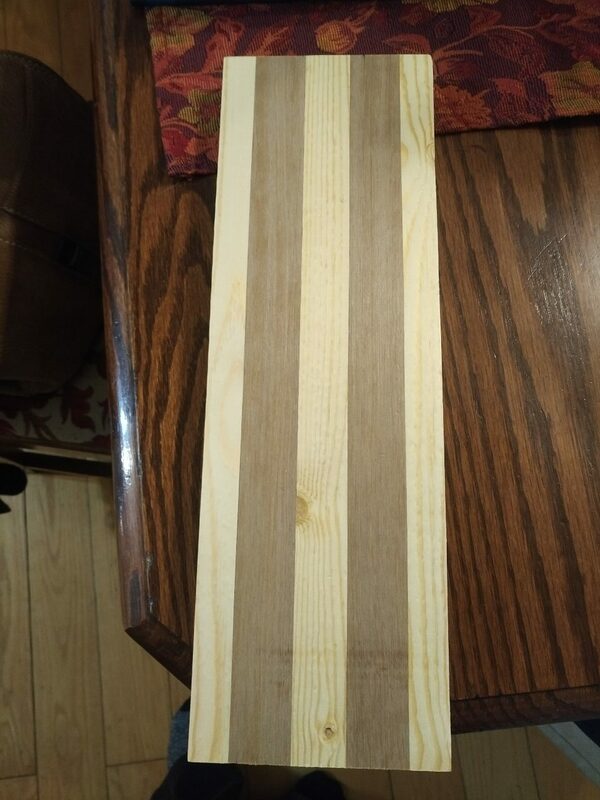 This entry was posted in Band saw, Card Games, Cribbage, Cribbage board, Fractions, Math, Measuring, Pine, Planer, Router, Scroll Saw, Scroll Saw, Stamping Tools, Table saw, Template, Tools, Walnut, Wood, Wood Stain, Woodworking and tagged Awl, Band Saw, Board games, Brass Pipe, Card Games, Clamps, Cribbage, Cribbage board, Deck of Cards, Drill Press, Felt, Felt lined, Fractions, Games, Glue, Magnet, Math, Measure, Measuring, Pattern, Pegs, Pine, Planer, Router, Scroll Saw, Senior's Center, Senior's Centre, Stain, Table Saw, Template, Walnut, Wood, Wood Stain, Woodworking on March 26, 2018 by AlwaysARedhead.